Fangled is an e-store full of quirky stationery products. They’ve got notebooks, postcards, greeting/message cards, stickers and a whole lot of products you’ll love to hoard. By now, our cupboards, desks, bags, and anything that has space are filled to the brim with stationery products we’ve crushed on in the past (there’s clearly an impulse buying problem there). And just when we thought there wasn’t any more scope or space left in our lives for more, we stumbled upon Fangled and let’s just say we’ve gone down that slippery slope all over again. Clearly, where there’s a will (or awesome stationery), there’s a way. Fangled does amazing graphic printed stationery like notebooks, postcards, greeting cards, stickers, paperclips and a lot of other small, quirky products. Their product designs range from motivating feminist quotes and funny one-liners to graphic prints and cool stickers you’d want to stick on everything you own. 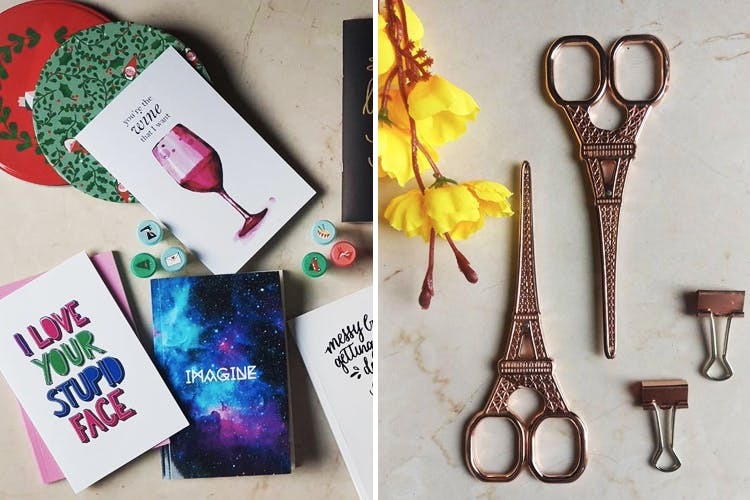 We love the Eiffel Tower scissors and the rose gold stationery which is definitely an Insta-score. We wish they had more options in every category; the selection, currently, is pretty limited. Find the perfect stationery item for your BFF in their their gifting section which has curated products based on different themes like TV shows, humour, music, quotes, travel and more.